Another day, another two hackerspaces! Actually Seattle is the only city on the route that has more than one hackerspace, so this post is actually destined to be quite unusual. It's not clear to me why Seattle has so many hackerspaces, but they all seem to have pretty active membership, so I guess there are just that many awesome people in Seattle! 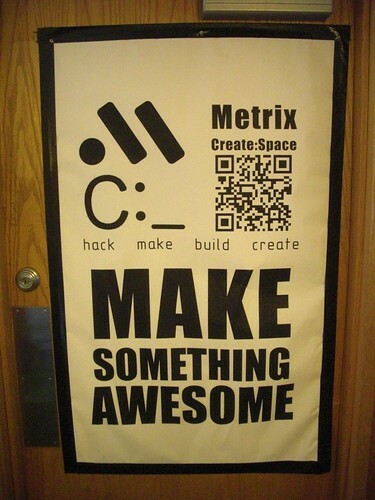 See my flickr sets: Metrix and Ada Bookstore, Hackerbot Labs. Metrix is located in an underground retail space, it was right next to the "Seattle Museum of Mysteries", so basically we had the rationalists right next door to the irrationalists, apparently much to the chagrin of both. However, as of last month the Museum has moved out, so I guess the rationalists have won! Metrix is clearly representing the Dwarves to Jigsaw's elves :-). They have two laser bots, and apparently the members have lots more as well - on "Makerbot Madness" nights, as many as 10 makerbots can be operating at Metrix, which is awesome. They also have a laser cutter than you can rent by the minute, $2. That sure puts my laser cutter time into perspective - I've sat by a laser cutter for hours on end, that would be hundreds of dollars! They also operate a pretty cool shop, you can buy all kinds of kits and components, lease tools, etc. I bought a bliplace from their awesome kit vending machine. 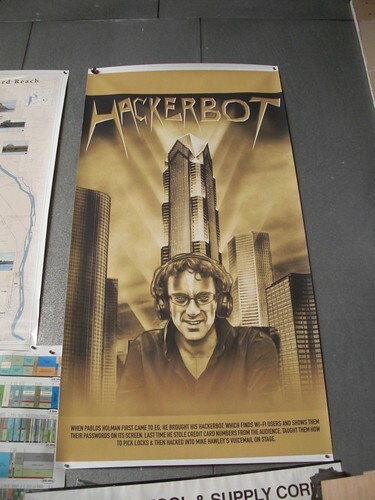 Hackerbot Labs is an awesome hackerspace in an industrial area, they have a very warehouse feel. While I was there they were having a laser-powered hot tub party, the hot tub was acting as the heat sink for the (liquid cooled) laser. Supposedly the 10W laser actually did lase while I was there, but I didn't get to see it thanks to the (totally necessary!) safety precautions. Instead I spent my time with Pip playing with the quarter shrinking machine, which was awesome. I got to load and fire the machine, shrinking my own quarter, as wall as a Hong Kong coin that I found in my car. We also made ice cream using liquid nitrogen. They have a huge variety of heavy equipment and industrial robots in the space; I think they probably qualify as the wizards of Seattle. I loved Seattle, I think thanks mostly to my wonderful hosts Willow and Pip. The city is clean, feels safe, and has tons of rad people. I guess I understand a little better how Erin and Nils could move here from San Francisco :-). Ah, looks like I missed you? Daniel said I should say hi, but then I couldn't find an email and he left the country. Drop me a line if you're still in town and want company/coffee tours.